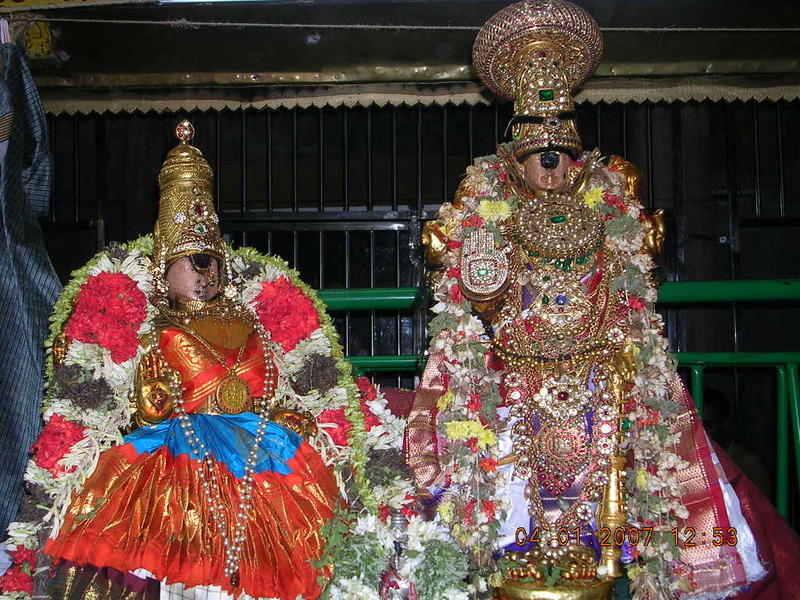 The next day pAtti takes parAsara and vyAsa to srIrangam temple via North Uththara vIdhi (street). As soon as they enter the temple. 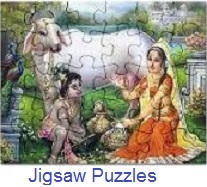 vyAsa and parAsara finds a sannidhi on their right side. vyAsa: pAtti, whose sannidhi is this? 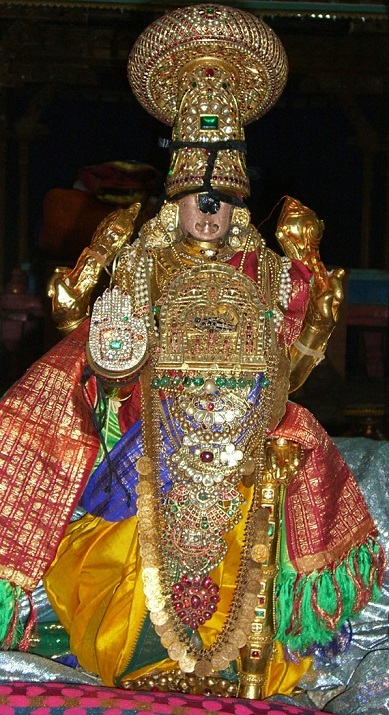 ANdAL pAtti: vyAsa, this is srI ranganAyaki thAyAr Sannidhi. parAsara: pAtti, but we only saw srI ranganAtha yesterday in the procession. ANdAL pAtti: Yes, parAsara. That is right. It is because, srI ranganAyaki thAyAr does not come out of her Sannidhi. Even srI ranganAtha has to visit her, if he wants to see her. parAsara: Oh! ok pAtti. That means, we need to visit her all the time. 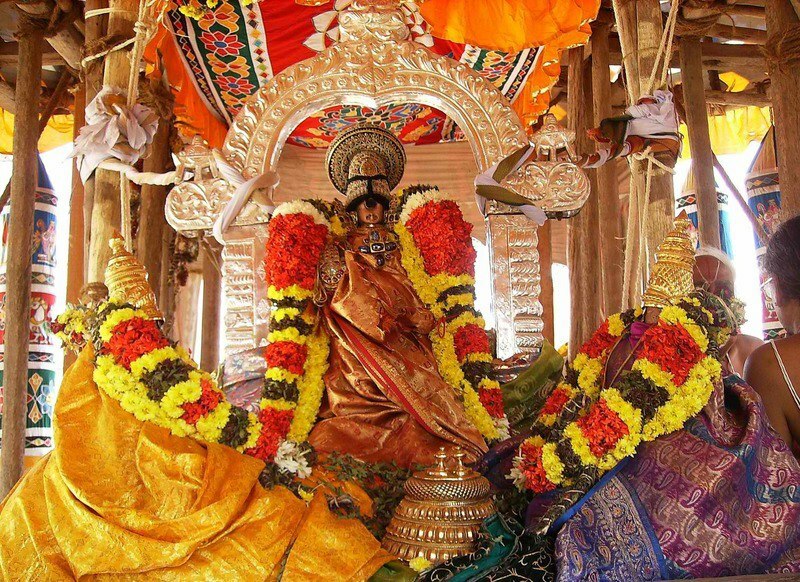 Now, we have one more reason to visit the temple, whenever we are in srIrangam. After the dharsan of thAyAr, they come out of the Sannidhi. ANdAL pAtti: Let me ask a question to both of you. When you both return home late in the evening after playing games, how do your father react? vyAsa: pAtti, He gets angry during those times. ANdAL pAtti: Do your father punish you then? parAsara: We rarely get punished pAtti. 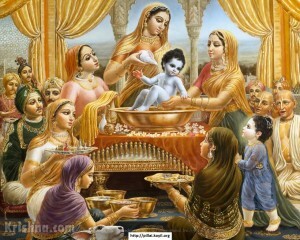 Whenever he is angry, our mother stops him from punishing us. 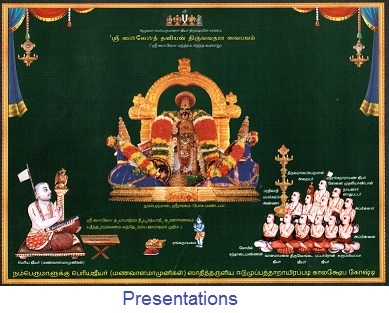 ANdAL pAtti: Just like that, we may do things which perumAL might not want us to do and he may feel like punishing us for it, during those times, thAyAr talks to perumAL and protects us from the punishment. parAsara: Then you are right, pAtti. She is like our mother. ANdAL pAtti: Atleast, namperumAL carries weapons though it is for our protection, but thAyAr carries lotus flowers only since she is very soft-natured. 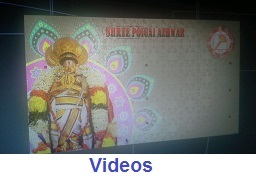 To reach perumAL you need to cross ranga-ranga gOpuram, then nAzhikettAn vAsal (entrance), then garudar Sannidhi, dhwajasthambam and then srI ranganAtha’s sannidhi. But As soon as you enter from North uthra vIdhi (street), you reach thAyAr Sannidhi. Thats how close she is to us. 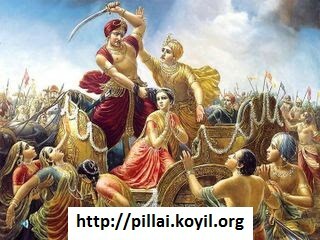 ANdAL pAtti: Even as Mother sIthA, she saved kAkAsura from srI rAma. kAkAsura, son of indhra, took the form of a crow and troubled her. srI rAma was going to punish him. But she mercifully saved kAkAsura from srI rAma. Similarly, she saves all the rAkshasis in the asOka vanam after srI rAma killed rAvaNa. hanumAn wanted to kill them all for the troubles they gave her. But she kindly saves them and explains to hanumAn that they were helpless at that time and had to execute rAvaNa’s orders. 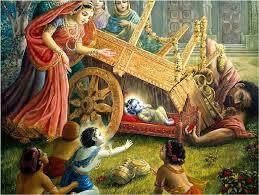 Thus, out of motherly affection, she tries to protect every one constantly. 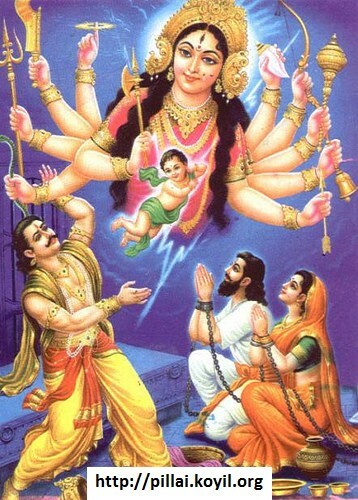 parAsara and vyAsa: Hope she can also save us all the time pAtti. ANdAL pAtti: She certainly will. 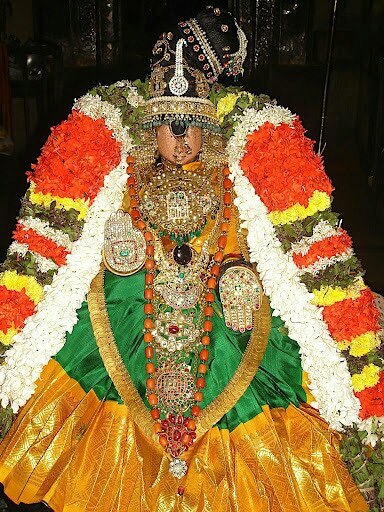 She will always recommend to perumAL to protect us as that is her primary duty. parAsara: Is that all she does pAtti? I mean “talking to perumAL in favour of us”? ANdAL pAtti: Well. She does that until perumAL accepts us. But once perumAL accepts us, she also sits with perumAL and enjoy our devotion and service towards them. vyAsa: How is that pAtti? ANdAL pAtti: Its very easy to understand. When you serve your parents, do you just serve your father? parAsara: No, pAtti. Both mother and father are equally dear to us. We would like to serve them both. ANdAL pAtti: Yes – you got it. Similarly, thAyAr helps us to reach perumAL by recommending to him. 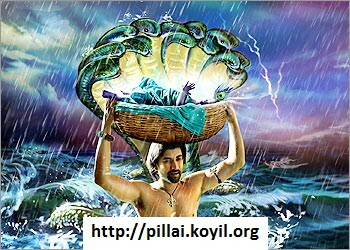 But once we reach perumAL, she also accepts our loving devotion along with perumAL. parAsara and vyAsa: Wow! This is very easy to understand pAtti. We hope to hear more next time. We want to go out and play now for some time. parAsara and vyAsa then runs out to play! This entry was posted in Beginner's guide, Stories and tagged perumal thayar ranganatha on August 30, 2014 by Sarathy Thothathri. 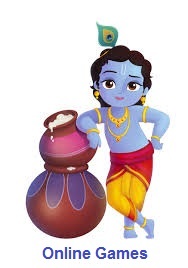 vyAsa: pAtti, whom are you arranging these fruits and flowers for? ANdAL pAtti: vyAsa, It is time for srIranganAthan’s procession and he visits us on the way. When someone visits us as our guests, especially elders, it is our duty to take care of them, while they are with us. That too when a grand eternal king visits us, we need to ensure that he is taken care of thoroughly. parAsara: Oh sure, pAtti. 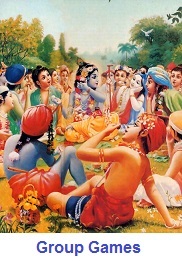 Then, I will give the fruits to srIranganAthan, when he arrives. ANdAL pAtti: That’s so nice of you, parAsara. Come, let’s wait at the entrance for his arrival. parAsara : pAtti, What does he hold on his left hand? 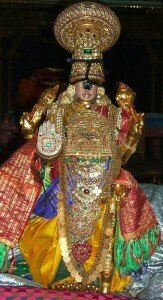 ANdAL pAtti: He holds a mace in his left hand, parAsara. 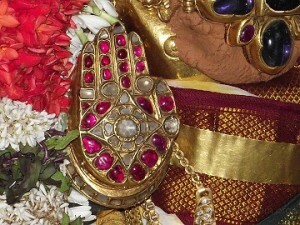 In the archAvathAram of srIranganAthan, he has four hands. On the other left hand over his shoulder, he holds a conch and on the hand seen above his right shoulder, he holds a sudharsana chakram. He shows his weapons to inform us, that he is always around to take care of us and to destroy our difficulties. vyAsa: What does the right hand signify, pAtti? ANdAL pAtti: That’s a nice question. His right hand is directed affectionately towards us to say that “I am here to take care of you, so don’t fear” and also to let us know his affection for all of us. Just like how a cow runs to a calf, when the calf needs her, no matter how the calf might have behaved before. 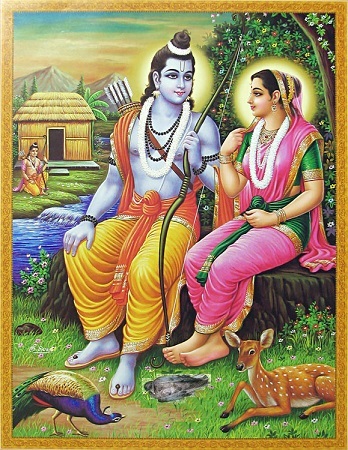 vyAsa: Ok, pAtti. Then, what does he have over his head? ANdAL pAtti: It’s a crown, vyAsa. It shows that he is the owner of everything in this world. ANdAL pAtti: Yes, he has the most adorable face. He is always happy being with us, that too when he is between children like you, he is even happier. parAsara: Yes, pAtti. I saw him from a very close distance. I could also see him smiling and his feet even closer. ANdAL pAtti: Oh, that’s nice parAsara. 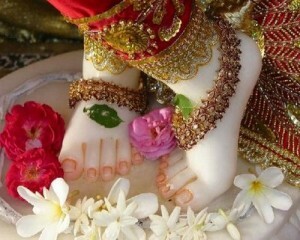 We usually say “lotus feet” due to its tender and beautiful nature. 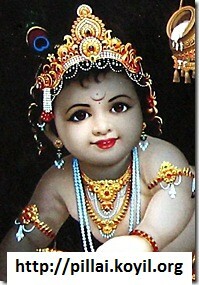 His smiling face indicates that he is easily he has descended joyfully to be with us. His lotus feet are so firmly placed over the pItam (lotus flower base), which means that he has come down for us and he will not leave us. 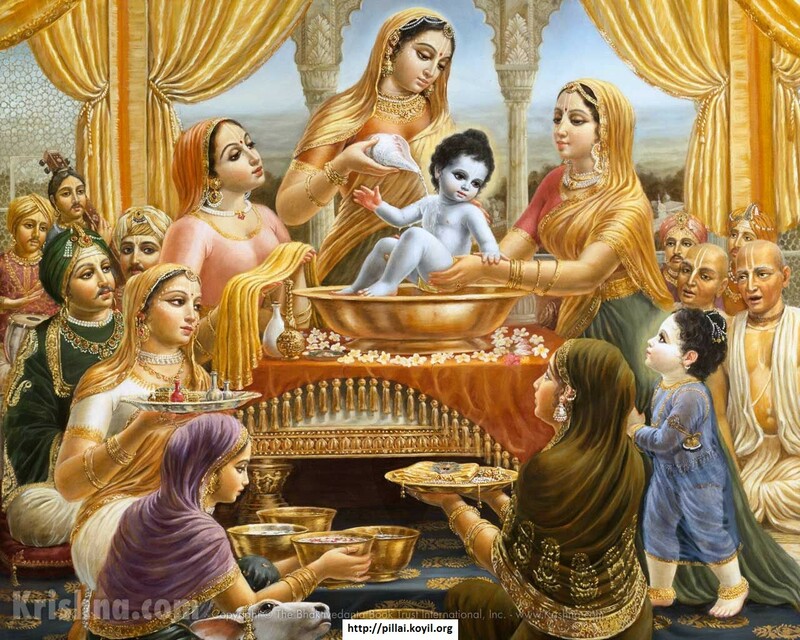 So, today, we have seen some of his main auspicious qualities in his archAvatharam form namely vAthsalyam (motherly forbearance – him showing his hand in protecting us), svAmithvam (supremacy – long crown), sauseelyam (mixing freely with us – ever-present smile in his beautiful face) and saulabhyam (easy approachability – his lotus feet which is easy to hold on to). vyAsa and parAsara stand in awe and their eyes follow the procession as it goes past them. This entry was posted in Beginner's guide, Stories on August 19, 2014 by Sarathy Thothathri.